After thousands of years we finally understand the dangers of asbestos. Today everyone knows that asbestos is dangerous. But this was not always the case throughout the ages. It turns out that asbestos has been used since ancient times, and it is only now, at the tail end of roughly 6,000 years of asbestos use, that we are able to fully understand the health risks posed by loose asbestos fibers. Looking at the history of asbestos helps to shed light on why this was such an attractive material and why it took so long for the general public to understand its dangers. Asbestos fibers have been found at archeological sites dating back 750,000 years, but because asbestos is a naturally-occurring mineral it impossible to say for certain whether these fibers were actually used by people. We do know that asbestos fibers were used as lamp and candle wicks as early as 4,000 BC. In ancient times, the fire-retardant properties of asbestos were often regarded as miraculous and found their way into many rituals. For example, Egyptians buried their Pharaohs wrapped in asbestos cloth and Greeks created shrouds from this substance to keep loved ones’ ashes separate in funeral pyres. In the former republic of Tannu Tuva in present-day Russia, shamans would don asbestos boots and walk through fire to prove their powers. As time passed, asbestos took on more practical everyday uses, and by the Middle Ages it was being used to create unburnable tablecloths, clothing, and bags. However, it wasn’t until the rise of the Industrial Revolution in the late 1800s that asbestos came to be widely and heavily used by the general public. 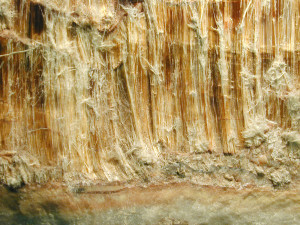 The ill effects of asbestos exposure were noted by the ancient Greeks, who described a “sickness of the lungs” in slaves who worked with asbestos. Roman historians also noted that miners tended to become ill and described the sheep-bladder respirators that some had fashioned in an attempt to protect themselves from the foul air of the mines. However, medical science was far from advanced at this time. Many people believed asbestos was the “wool” of a giant lizard—a belief Marco Polo disproved in 1208. By the turn of the 20th century, medical science had greatly improved. In 1898 a report documented lung damage in English asbestos workers, and in 1906 the first asbestos-related death was documented, complete with an autopsy that found the lungs filled with asbestos fibers. However, despite this evidence, there was not much effort to protect workers. In Greek and Roman times, workers were easily replaced slaves, and in the Industrial Revolution conditions were often not much better. The demand for asbestos products was so strong that few wanted to investigate the health and safety of these lowly workers. Perhaps the biggest blow to asbestos came when the public realized that is was not only workers that were at risk—anyone who came into contact with asbestos had the potential to develop serious, life-threatening health problems later on. Finally, in 1989, the US banned asbestos. While the ban was overturned a few years later, the mark on the public consciousness had been made and asbestos use declined naturally to a great extent. Today, many asbestos-containing materials remain in our communities, especially in buildings built from the 1930s to 1970s. At H2 Environmental, we provide the specialized skills and knowledge needed to successfully orchestrate cleanups of contaminated sites.